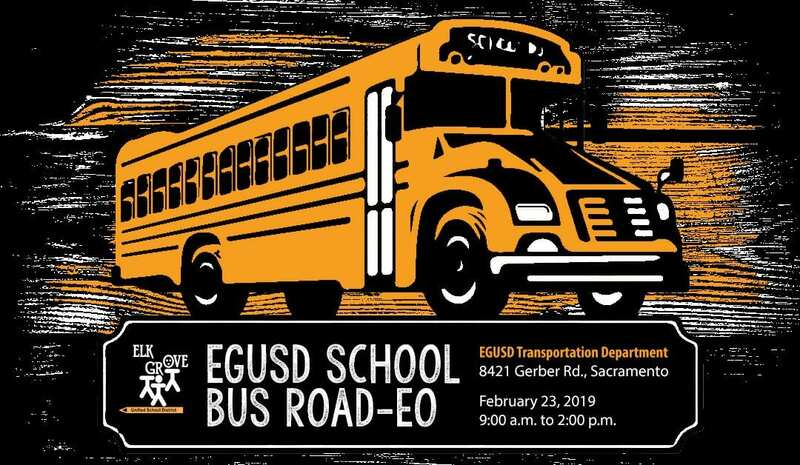 WHAT: The Elk Grove Unified School District (EGUSD) is hosting a School Bus Road-eo for bus drivers to showcase their driving skills. The day-long friendly competition requires drivers to demonstrate their safe driving skills in order to walk away from the road-eo as the winner. The public is encouraged to attend to better understand the elements that go into being a school bus driver in order to transport our most precious passengers, our students, to and from school safely. Families are also invited to attend and participate in all activities, including face-painting, games and a raffle and prize drawing as well as to visit a variety of booths. The EGUSD Transportation Department is also hiring and will be available to speak about open career opportunities. WHEN: Saturday, February 23, 2019, from 9:00 a.m. to 2:00 p.m.
WHO: District school bus drivers, community members, EGUSD students and families. WHY: The friendly competition between school bus drivers will showcase their safe driving practices in order to transport students to and from school safely. The event will also encourage attendees to better understand what it takes for bus drivers to do their jobs safely.